I can’t tell you how many women I’ve spoken to who have felt frustrated by the lack of support they’ve received from their physicians. Have you ever felt this way? Have you found yourself in your doctor’s office hoping to find some answers to what’s happening in your cycle only to be told that you were overreacting? Did you leave your appointment with a prescription for the pill and even more questions than you had before you came in? If so, you’re definitely not alone. The thing is that in order to receive the attention and support you need to improve your menstrual cycle health and fertility naturally, you must think of it as a team sport. The moment you begin relying on one practitioner for everything you’re bound to get disappointed. Just like there are athletes of varying skill and ability, healthcare practitioners also have different skill sets, abilities and interests. It is important to first consider the paradigm that your healthcare professional is operating from. What are their perspectives about the body and it’s ability to heal? Do they have any experience treating menstrual cycle issues without using drugs? Do they even believe that it is possible to do that? There is a serious movement away from the “pill for every ill” model of medical care towards a more functional approach. An approach that is aimed at identifying the root cause and working with your body to reverse illness. However this movement has not made it’s way into your average doctor’s office. For this reason, when you’re assembling your team you’ll want to be clear about the role that each member plays. You need to understand where your doctor is coming from. Just like I wouldn’t go to Starbucks to buy lingerie, you can’t expect to go into your doctor’s office and leave with a non-invasive holistic health plan to restore your menstrual cycle health naturally. This is not the model your doctor was taught in medical school. Most doctors were trained to approach menstrual cycle issues as an “illness” to be “fixed” with some sort of medication (i.e. pain killers and/or the pill). It is best to understand that fully so you don’t go in there thinking you’re going to convince your doctor of something that doesn’t align with the paradigm she operates from. I released an entire podcast episode on this topic. I interviewed Dr. Miranda Naylor, a medical doctor, who shares with us exactly where doctor’s are coming from so we can temper our expectations accordingly. You’ll be better served by having a great doctor on your team, and in addition to your doctor you’ll also want to have a few other professionals there to support you (i.e. an acupuncturist, a naturopath, a chiropractor, a holistic reproductive health practitioner, a fertility awareness educator, a health coach, and the list goes on). This is a structural issue with medical care overall, not a specific dis towards your doctor in particular. The healthcare system is what it is. Doctors are limited in terms of how much time they are able to devote to each patient during visits. As such, appointments are pretty short. This lends itself to a specific type of care which involves you telling your doctor your symptoms, followed by an on the spot assessment based on those symptoms. This leads to either a recommendation for further assessment (i.e. testing, a referral to a specialist), and/or treatment (i.e. prescription, lifestyle recommendations). This typically happens within the span of 5-10 minutes. On the other hand, my clients complete a detailed intake form (10-15 pages) that gives me a much deeper understanding of their overall menstrual cycle health. Intake sessions are 90 minutes long, and follow-up sessions are 60 minutes in length. My clients often tell me that it is the first time someone has gone through their health history with them in such a detailed way. When was the last time your doctor asked you how you were sleeping? What your stress levels were like? If you enjoy your job? When you first started menstruating? How much bleeding you have during your periods? If you have mood changes throughout your cycles? Again, in all fairness, these things may fall outside of the scope of the medical care your physician is providing you. Your physician may wish she could go into that level of detail with you, but within a 5-10 minute session it just isn’t possible to do that. Another reason your doctor may not be doing as thorough of an investigation into your overall health and how it connects to your menstrual cycle health is that all paths lead to the pill. In my interview with Dr. Naylor, one of the themes that came out was that in medical school all menstrual cycle related issues were addressed with hormonal contraceptives. The pill is still taught as a drug that “regulates the menstrual cycle” and “helps” women to bleed regularly. In case you don’t know already, the pill does no such thing. Hormonal contraceptives suppress your healthy natural hormone cycle. When the pill was first developed the artificial hormones were purposely put in increments of 21 days to induce withdrawal bleeding that mimicked your period. This was the only way to get women to take it. This huge lie has created a medical machine that prescribes the pill for every single issue you ever have with your menstrual cycle. PCOS? Heavy Periods? Painful Periods? Irregular Periods? Acne? Amenorrhea? Fibroids? Endometriosis? Adenomyosis? No problem! The pill is prescribed as “treatment” for pretty much everything you can imagine. If the paradigm is that you just go ahead and prescribe the pill for everything, then it makes sense why your doctor isn’t doing a thorough investigation of what could really be causing your period problems. From her perspective it doesn’t much matter why your periods are irregular because, regardless of why you have period problems, you’re still going to leave her office with a prescription for the pill (or other hormonal contraceptive). One of the things that causes me a great deal of sadness in the work I do with women is the overarching idea that her body just can’t do it. One of the things that this medical model can do is mess with your mind a little. Believing that for every illness you experience you require “drugs” to “fix” yourself can leave you with the distinct feeling that you are broken. Many of my clients have a deep fear that something is horribly wrong with them. Have you ever felt that way? Have you ever found yourself wondering why your cycles are such a mess? Why no one can figure out what’s wrong with you? You’re not the only one. The thing is that you may have been asking the wrong person for support. My suggestion is to change your perspective about your menstrual cycle issues. Instead of thinking that something is wrong with you, consider that your body is trying to communicate something important to you. If you only have your period 4 times per year that is your body’s way of telling you that something is wrong. Your body gives you clues all the time, but you’ll only notice them if you’re paying attention. Charting your cycles with fertility awareness allows you to pay attention and start appreciating and understanding the messages your body is trying to send you. As you make positive changes to improve your health, you will see improvements in your menstrual cycle right there on your charts. Your charts will tell you if you’re moving in the right direction. From this perspective, there is nothing wrong with you. What we think of as illness is actually the body’s way of telling us that we are out of alignment. You learn to work with your body, and you also learn that your body can heal if you work with her. A great analogy of this is to think about cars. When you buy a new car they have the base model, and from there there are a number of features you can add on to customize it and get exactly what you want in a vehicle. For some reason science is based on the idea that men are the base model, and women are just men with different “features”. To this day many medications that are put on the market were only tested in men since men are considered the “standard model”. From this patriarchal, male centered perspective we all seem to think that we can shut down a woman’s entire reproductive system with powerful drugs and it will have no impact on the rest of her body. That is why you can go into your doctor’s office and your doctor knows little about the menstrual cycle and the role of cervical mucus in your cycle (for example). That is why little attention is payed to the inner workings of your menstrual cycle. As long as we are considered to be a “lesser version” of the male body, our menstrual cycles are not thought of as important or significant as far as our health is concerned. 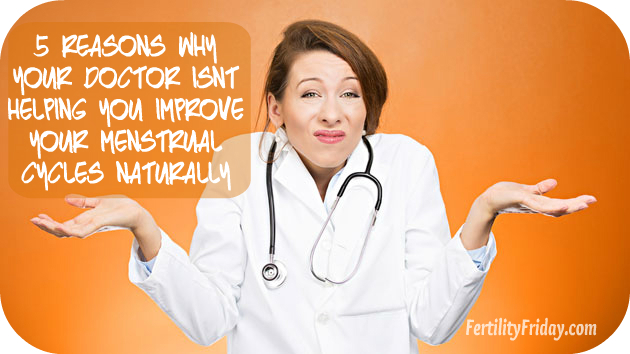 Why don’t you ask your doctor if shutting down your menstrual cycle with the pill will have any negative effects on your health or your fertility in the future? I’m fairly confident that you’ll get quite an earful about how it is actually good for you, and has no negative impact on your health or your fertility. If you instead talk to women who have used hormonal contraceptives and experienced some of the most common side effects (i.e. depression, loss of libido, anxiety, mood changes, delay in the return of ovulation/menstruation…the list goes on), you’ll find out what a detrimental impact those little pills can really have on your emotional and physical health. We have a long way to go before it is acknowledged that your reproductive organs are not separate from you. They are an integral part of what makes you you. You can’t shut down your ovaries without affecting your entire body in some way. I purposely said he to highlight the patriarchal foundation of modern medicine. The model is that he is the expert and you are the patient. He knows more about your body than you do, and he knows best. Modern medicine has been set up in an extremely paternalistic way. Just like children aren’t supposed to question their parents, you are not to question your doctor. This sets up an interaction that can make it challenging for you to pay attention to your intuition. If your doctor suggests a treatment plan for you that you don’t feel comfortable with are your feelings validated when you share them? Or are you just reassured that you are overreacting? The perfect example of this is how many women have legitimate concerns about the effect hormonal contraceptives could be having on their fertility. Have you ever gone to your doctor and asked her if you should go off the pill several months or more before you plan to start a family? If so, what were you told? If your experience was anything like most women’s you were probably told that you should stay on the pill until you’re ready to start a family. That there’s no need to come off early. I would argue that it’s your intuition bubbling up to the surface telling you that something doesn’t seem right about this. It can’t be good for your body to be on artificial hormones right up until you’re ready to get pregnant, can it? No one can know more about your body than you because you live in your body all the time. Trust your intuition, and have the courage to question your doctor if what she tells you doesn’t feel right. And don’t be afraid to seek support from other practitioners if you aren’t getting the answers you’re looking for. Now I want to hear from you! Have you had a negative experience with your doctor? Is your doctor absolutely amazing? Did you receive the support you needed to address your menstrual cycle issues? Please share your experience in the comments below! This has definitely been my experience. When I went to school for Nursing, a few years ago, I found out a lot about how the human body works, and I realized that many of my medications would eventually have a negative effect on me. Especially the birth control, so I decided to stop taking it. I’d only been off a few weeks when I went back to my gynecologist for a check up. When I told her I’d stopped taking the pill for a few weeks, she was LIVID. She yelled at me, saying she wished I’d speak to my doctor instead of listening to professors who don’t know what they’re talking about. I stopped taking Norethindrone because my face looked like a pizza, I couldn’t be thirsty enough, I screamed at my boyfriend for no reason, he didn’t want to touch me due to vaginal changes, my skin developed a red rash on my breast and face around my eye and eyebrow. I still got migraines and still had cramps although they were small but it was everyday. Where as without birth control it’s only 2-3 days with severe cramps that I can barley walk to the bathroom from my bedroom. The doctor does not think it’s Endo or anything other than too much progestaglandin that make me sick to my stomach.. I’ve had two different gynos and been to the hospital once because they said it was gastritis a stomach flu. I’ve had two gynos because one told me I had too much fatty cells and needed to change my diet. I ate organic for 6 months nothing changed. Many time I laid in the cold tub rocking myself back and forth crying and screaming in pain sweating enough to look like I was in the shower and vomited along with cold chills. I feel hopeless and ready to give up. No doctor understands the frustration of having to miss work and school feeling nauseated all the time. She just told me I had to go back on birth control because there are no other options for me because of my migraines and bleeding complications. I was on birth control for 5 years in my teens and don’t want to do it anymore.. why won’t they listen and how do you get them too? I’m giving up. While on the pill, I only got my period MAYBE 3-4x a year. Now I’m off of it (as of July 1) and have been TTC; however, I have yet to get my period. When I told my doctor, her first response was to get me on progesterone. After taking this, and waiting the 2 weeks after still no period. My next step is to get blood work done this week. Lisa- I’m concerned that the doctor won’t listen to what my body REALLY needs and will just keep feeding me medicine. How do I take control and what are the next steps I should be taking? I know this is an older post but I’m at a loss, at what I should do. I have had a never ending period, I’m currently on day 16 and it’s so heavy. Prior to this I was only without a period for a few days and was on my period for 14 days before that. I’m exhausted and have tried everything. My Dr had written down I have an allergy to birth control, due to nuva ring making me so depressed and sick I was almost suicidal. But guess what? The other day 14 days ago to be exact she told me to start a different birth control. I’m still bleeding and starting to feel sad again. Where do you go from here? I’m 35 and have 2 boys. I just want a hysterectomy and to be done with all this. But nobody will help me. Hi Kim, it may be time to find another doctor. Continuous bleeding could be a sign of a serious problem. If your doctor is not willing to evaluate you, consider finding a doctor who will. Thank you for this article – so nice to know i am not alone!! I had bounced from doctor to doctor for years when I was suffering with “adrenal fatigue” (or HPA axis disregulation) because they all just told me I was imagining it and nothing was wrong with me because my blood tests were normal and finally got onto a great naturopath who helped me overcome it. And now that I am TTC the same thing is happening with my menstrual issues. I chose a female doctor with ob/gyn interest and expressed concerns that I wasn’t ovulating regularly as I have only had a temp rise on 3 out of my 8 charts. She dismissed BBT as unreliable. My cycles range from 28-66 days, most of them between 35-45 days and she considered that regular enough to prove I am ovulating. I had day 21 progesterone blood test done and she sent me a letter saying it was normal and that I had ovulated. I am now at least 16DPO if that was the case but I am definitely not pregnant! And my temperature has remained in the same range for my whole cycle, never rising at all. So i think she just told me that to get rid of me!! Even my naturopath who was excellent with everything else was of the opinion that I must’ve been ovulating, because if you aren’t you don’t get a period as regularly as I do. It is so hard to disagree with practitioners and get yourself heard because they are meant to be the expert after all! If you know of any type of practitioner in Western Australia that is experienced with the fertility awareness method and hormone balancing I would love to hear about them…thanks!